1. AIPMT Medical Entrance Exam 2014 : All India Pre medical Test, this test is conducted by CBSE for 15% of the total seats in all the medical and dental colleges that are run by the Union of India, state governments, municipal, or other local authorities in India. AIPMT is a multiple choice type exam with questions from Physics, Chemistry and Biology. Unlike past AIPMT will be held in single stage. In 2014 the test will be held on 4th May. The test is conducted in Hindi and English both. 2. AIIMS MBBS Entrance Exam 2014 : AIIMS is one of the best medical colleges in India. AIIMS is an Autonomous institution and conducts its own entrance at all India level. The exam is for 72 seats in AIIMS Delhi and 100 each in six AIIMS like institutes in Bhopal, Patna, Jodhpur, Rishikesh, Raipur, Bhubaneshwar. The test is conducted in online as well as offline mode. The application process begins in the month of March and in the year 2014 the exam will be held on 1st of June. The exam is of 3 and half hours duration and carries total 200 marks. There is negative marking and Multiple choice type questions are asked from Physics (60 marks), Chemistry( 60 marks), Botany and Zoology ( 60 Marks) and there is a 20 marks section of General Knowledge. The Question paper is available in Hindi and English. A merit list on the basis on this entrance is prepared and admissions are offered. The fee is h=just Rs 6000 per semester. 3. AFMC: Armed Forces Medical College is another very reputed college in India. AFMC has a total of 130 seats and 25 are reserved for girls. In 2014 the admission will be taken through Medical entrance exam AIPMT 2014 conducted by CBSE. Students from the merit list of the test will be called for interview. 4. 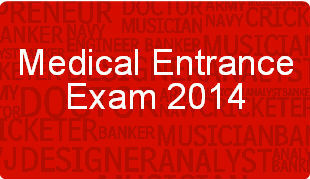 CMC Vellore Medical Entrance Exam 2014 : The admission process starts from mid February and is closed in march. The test will be conducted on 23rd may in 2014. The students have to appear in entrance conducted by CMC Vellore and short listed candidates have to appear in interview and practical tests conducted in Vellore. There are 16 open seats and 84 sponsored seats. The entrance exam consists of multiple choice questions Physics, Chemistry, Biology and General Ability with emphasis on Speed and Accuracy and a few questions on issues of current topical interest. The examination is conducted in ENGLISH. 5. MGIMS medical entrance exam 2014: Mahatma Gandhi Institute of Medical Sciences MGIMS conducts its own entrance test to for fill the seats in the MBBS course. In the entrance examination the paper of physics, chemistry and biology will have multiple choice questions, while that on Gandhian thought will be of long and short answer type. There are no paid seats. There are 46 seats for Maharashtra students and 46 seats for Non Maharashtra students. The admission process starts in the month of December and entrance was conducted on 20th April. 6. UPCMET Medical Entrance Exam 2014: The association of unaided medical colleges in UP conduct their own entrance exam called UPCMET. In 2013 they conducted their first entrance exam on 30 th May. . The exam consisted of Physics, Chemistry, Btany andZoology. All the subjects carry 50 questions each and there is a qualifying paper of English also. There are 50 question in that paper also. There is negative marking. The exam in s=conducted for 1500 seats in various private medical colleges in UP. 7. CET Medical Entrance Exam 2014: For Karnataka students, CET is conducted for admission to MBBS, BDS and also engineering courses. There are free seats, payment seats and management quota seas in various colleges. For students from other states COMEDK exam is conducted by private medical, Dental and engineering colleges. The students have to appear in papers of Physics, Chemistry and Biology. 8. BHU Medical Entrance Exam 2014: BHU in among the top medical colleges in India and in 2014 there will be no separate exam and the admission will be on the basis of AIPMT 2014. 9. EAMCET Medical Entrance Exam 2014: In the state of AP the admission to MBBS, Engineering and Agriculture courses is done through EAMCET. JNTU conducts this entrance and students have to appear in physics, chemistry and Biology papers for the entrance. The entrance is conducted in May . 10. UPMT Medical Entrance Exam 2014: UPMT Uttarakhand Pre Medical Test 2014 entrance exam after 12th will be conducted by G B Pant Agriculture and Technology University, Pantnagar for admission to state quota seats for MBBS and BDS courses in various Medical Colleges in Uttarakhand for the year 2014-15. The applications will be closed on 21st April and the test will be conducted on 18th May 2014. Find out whether Medical/ MBBS is best for you!